The second trial in the Biltmore International Rose Trials competition came to a close this past Saturday when an international jury selected the winning roses in 11 categories. “Miracle On The Hudson,” bred by Robert Neal Rippetoe in California, took the George & Edith Vanderbilt Award for Most Outstanding Rose. “Miracle” also took the top spot in three additional categories: the Chauncey Beadle Award for Best Shrub Rose; the William Cecil Award for Best Growth Habit; and the Lord Burleigh Award for Most Disease Resistant. Since 2011, Biltmore’s Rose Garden has been home to the trials in which more than 90 varieties from growers and breeders worldwide have been planted and cared for by Biltmore’s expert horticulturalists. Each trial lasts two years and a permanent jury judges the roses four times per year. During this year’s competition, the international and permanent juries conducted the final round of judging for the trial group of 29 roses planted in 2012. Before entering their roses into trials and competition, breeders work on their creations for four or five years prior. The roses judged this year were from Canada, France, Ireland, Germany, the UK and the U.S. Rose trials are a more common occurrence in Europe, with trials held in 20 different locations in 15 countries. New rose varieties will be planted for trials each May. They are evaluated for garden performance, fragrance, disease resistance and ability to be used in varying landscape situations. The next awards will be in 2015 for the trials planted in 2013 and will continue annually. Congratulations to all of the winners of the second annual Biltmore International Rose Trials! “Miracle On The Hudson,” bred by Neal Rippetoe of California, winner George & Edith Vanderbilt Award for Most Outstanding Rose Of The Trials (Best in Show); Chauncey Beadle Award for Best Shrub Rose; William Cecil Award for Best Growth Habit; and Lord Burleigh Award for Most Disease Resistant. Available through Roses Unlimited. “Sweet Drift” bred by Meilland in France, distributed by Star Roses and Plants available at garden centers nationwide. “Tequila Supreme” bred by Meilland in France, distributed by Star Roses and Plants available at garden centers nationwide. “Pookah” – polyantha bred in California by James Delahanty and available through Burlington Rose Nursery in California. “Bajazzo” bred in Germany by Kordes, available through Roses Unlimited. “Francis Meilland” bred by Meilland in France, distributed by Star Roses and Plants available in garden centers nationwide. “Munstead Wood” bred in the UK by David Austin Roses and available in the U.S. through David Austin Roses in Tyler, TX. 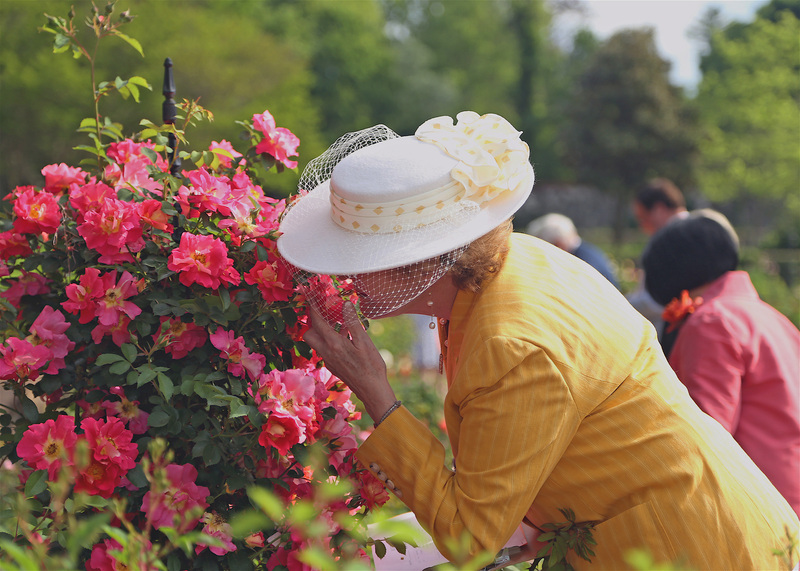 Top photo: International Rose Trials jury member Susan V. Fox gets in close to enjoy the scent of "Bajazzo," winner of Best Climber category.